looking back on recent posts, we realized that we haven't shared many beef recipes. with weather warming up, bbq season fast approaching and cinco de mayo just around the corner, we thought this simple marinade for easy & fresh carne asada tacos sounded perfect. you are welcome to throw in some sour cream, pico de gallo or any of your favorite taco garnishes but we wanted to keep this recipe basic and fresh, just like the delicious tacos we get at our local taqueria or taco truck. enjoy these tasty tacos on a warm afternoon with good friends and a great margarita! place flank steak and all remaining marinade ingredients in a large zip lock bag and massage to evenly distribute flavors over meat. refrigerate for minimum of 1 hour and up to 6 hours. preheat grill or grill pan over high heat. grill steak approximately 3 minutes per side, or until center reaches 145 degrees F, for medium doneness. let rest 5-10 minutes before slicing. 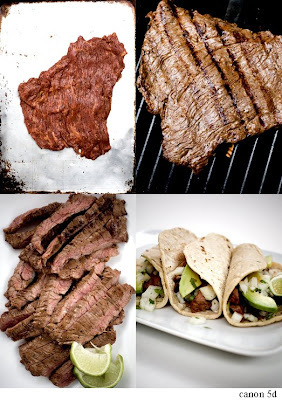 to assemble taco, place a few slices of steak in warmed tortilla and top with avocado, onions and cilantro. squeeze generously with juice from lime wedges.